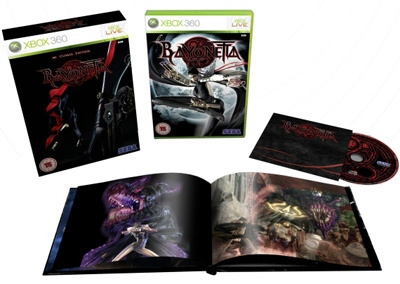 With many of the year’s most anticipated titles being shoved unceremoniously back into 2010, word on special editions has been scant up until recently when Bayonetta opened up a pre-order salvo with a collector’s edition to turn heads. There is, however, a catch. As usual, different territories end up playing the lottery game, with one usually winning out with the most jam packed or juiciest set for themselves while everyone else settles for second best. This time Australia and New Zealand have emerged the victors, while the US, UK, and the rest sit back licking their wounds. It features (aside from the game, obviously), premium slipcase packaging, a 36 page hardcover art book, premium Scarborough Fair gun collectable, and a CD soundtrack. 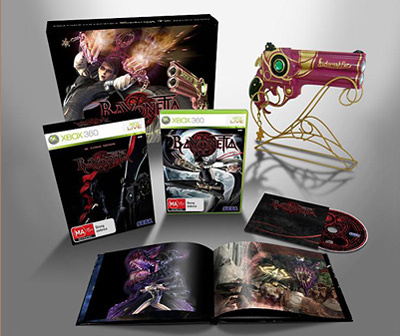 The main difference between this set and the UK Play.com exclusive edition, apart from the gun, is that the picture features a stunning, large black outer box which appears to be in addition the regular slip case. It should be noted that the replica gun is pre-order only and there is limited stock available, so get your skates on if you are planning on snagging one. It features the game (natch), Limited Edition slipcase packaging, art book, and the CD soundtrack and looks reasonably smart, though next to the Aussie edition, seems a touch lacking, since the stunning big box appears to be MIA. However, anyone eschewing the rest of the set and merely lusting after the replica gun will be happy to note that developer Sega has revealed that anyone fast enough to get their pre-orders in for either the Xbox 360 or PlayStation 3 version through the game.com website would get the rather gorgeous, detailed replica of Bayonetta’s Scarborough Fair gun which comes with its own display stand. So far, I have seen nothing on Game.com or Gameplay.co.uk which indicates a pre-order bonus of the gun, so if you are going down this route, it may be worth contacting Game directly to confirm before you decide. So if the gun is your sole priority, order from Game.com. If you want the nifty set and can live without the gun, go for the Play.com exclusive, and if you simply have to have the lot, including the smart outer box, then import it. However, since it is supposed to be exclusive to Australia and New Zealand, many sites will not ship it to the UK, with a few exceptions. Personally, my money is (literally) on DVDCrave since it works out at half the cost of MightyApe, mainly down to the shipping, but the choice is yours. Happy hunting. I really dislike the pre order bonus system that has emerged in full force this year. There was a time when I used to pre order from places depending on two factors: 1) I have a loyalty card 2) price. Now I have to worry about the version I want meaning that odds are I’ll miss out on either option 1 or 2, or perhaps even both. Understand that pre order bonus incentives are important to retailers I can’t help but gamers are the ones loosing out, again. Even more frustrating are the pre order schemes that see you getting various additional content depending on where you buy the game from, that’s something that really pops my bubble, Batman Arkham Asylum being a prime example. The sets in other countries tend to always look better or be higher quality though…again with Batman this year. The US version had a Batarang box and leather journal rather than the drabber stuff int he UK set….subtle differences to some perhaps, but a source of frustration none the less.